On Friday, Esquire.com's Ben Collins wrote a blog post in which some awkward phrasing made it appear as though tonight's episode of Monday Night Countdown on ESPN will feature a special panel discussion on domestic violence. On Monday night, a panel on a two-hour pregame show for Monday Night Football will, among other things, address domestic abuse. This panel will discuss, once again, the appropriate penalty for hitting a woman. The panel for that discussion will include the following people: Chris Berman, Cris Carter, Mike Ditka, Adam Schefter, Tom Jackson, Keyshawn Johnson, Jon Gruden, Mike Tirico, Stuart Scott, Steve Young and Ray Lewis. Up to 11 men, all between the ages of 39 and 74 will sit at the table for a domestic violence discussion on ESPN. Zero women. Victims of domestic violence in America are most likely to be women aged 20-24. When the show has updates from the field—brief reports about injuries and the upcoming game—they'll cut to female sideline reporters, Lisa Salters and, on some weeks, Suzy Kolber. These people are not allowed at the table. "By having a roundtable on domestic violence and not including any women, much less survivors of domestic violence, the panel is the height of ignorance by ESPN. ESPN must be getting their PR advice from their buddies at the NFL. Both the NFL and ESPN seem to greatly misunderstand the problem they are trying to address and the millions of people's lives it effects." While it's good to see ESPN taking on the issue of domestic violence within the NFL tonight, we strongly believe that they should also include the voices of women and survivors of domestic violence at the table. With nearly 45% of NFL fans and viewers being women, including women at the table not only would add to the discussion but would address the realities of their audience and the issue at hand." 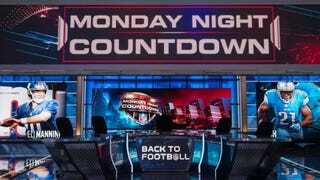 But tonight's episode of Monday Night Countdown is just going to be a regular episode, and will not be featuring any special discussion about domestic violence. We reached out to ESPN PR, who told us that talk of the special panel was "false info" and that tonight will feature a "regular episode of Countdown hosted by Suzy Kolber." There are certainly criticisms to be made of Monday Night Countdown fielding such a dude-heavy panel that is painfully ill-equipped to speak intelligently about any issue of substance, as has been proven in the past. Tonight, however, it's highly unlikely that domestic violence will even come up. Contrary to published reports in Esquire, there was no panel on domestic violence ever planned for tonight's Monday Night Countdown. We will present our normal Monday Night Football pre-game show, with Suzy Kolber hosting and Lisa Salters reporting. ESPN is proud of the work it has done covering the issue of domestic violence, and is committed to continued coverage. Much of that work has been informed by several talented female colleagues from our television and espnW platforms, including Hannah Storm, Jemele Hill, Jane McManus, Kate Fagan, Sarah Spain and more. Update no. 2: Esquire has appended this clarification to its story. The original opening sentence of this piece was widely interpreted as saying that ESPN was set to run a special panel, hosted only by men, which would address the specific subject of domestic violence in the NFL. In fact, we believed the pre-game show was to run as normal, with a segment on domestic violence. We apologize for the confusion that the language of our opening statement created and we have been told that ESPN was not planning to cover this topic in such a format and has covered domestic violence on air before with its female commentators. The first sentence and headline have been amended to reflect this change.